Belvedere Vodka is opening Cafe Belvedere, a pop-up devoted to Espresso Martini, from Thursday 15th - Sunday 18th February 2018. Taking place during London Fashion Week, single serves will cost just £5, with a set of 6 for £30, or other specially created cocktails from Savoy mixologist Martin Hudak for just £10. Make sure you find time to pop in! "Belvedere Vodka has been defined by Polish rye and superior natural ingredients since its inception and, as theoriginal luxury vodka, Belvedere is bringing the iconic cocktail – the espresso martini – back to its spiritual home in Soho, opening Café Belvedere from Thursday 15th February until Sunday 18th February. The drop in pop-up will be open during London Fashion Week, providing both style and substance for the ultimate fashion crowd, shoppers and vodka connoisseurs alike. Belvedere in Italian translates to ‘beautiful to see’ and inspired by this concept the brand is bringing to life Café Belvedere; a premium, industrial style coffee shop, serving only the ultimate espresso martini. The espresso martini’s origins are traced back to London’s Soho in the 1980’s, now Belvedere will bring their own twist on an iconic classic back to the same vibrant area. 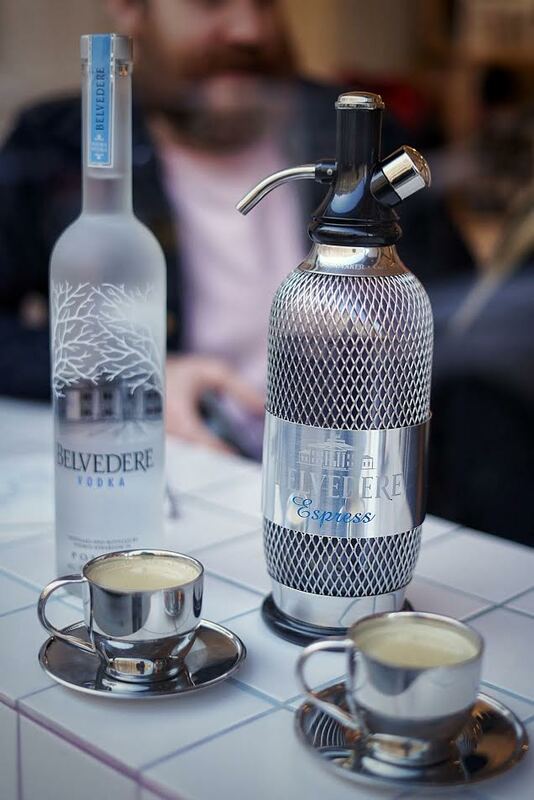 At Café Belvedere, Belvedere will preview the new Belvedere Espress, the fastest Espresso martini serve from a vintage inspired syphon and designed to be enjoyed and shared with six friends. Alternatively, drinkers can choose from three cocktails specially curated by senior Savoy mixologist, Martin Hudak, that offer a new twist on a classic coffee based cocktail – using Belvedere slowly infused with fresh mint or ice-cold Columbian brew coffee. Known and celebrated for its all-natural, additive free character, Belvedere Vodka will be collaborating with partners who also share excellence, provenance and purity at their core; Martin Hudak – ‘Coffee in Good Spirits’ champion 2017 who is bringing his expertise, Over Under bringing their locally roasted coffee beans, and Mr Black brings award-winning coffee liqueur. Belvedere branded tuk tuks will be also be shuttling guests around the Soho area throughout London Fashion Week, ensuring editors and fashion show-goers get to their destination on time, and can also find time to visit Café Belvedere to fuel and re-charge with an espresso martini."